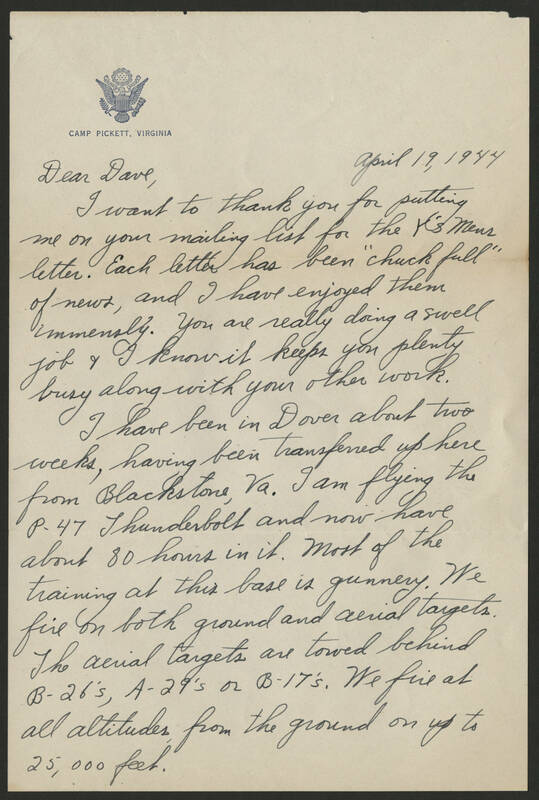 Camp Pickett, Virginia April 19, 1944 Dear Dave, I want to thank you for putting me on your mailing list for the Y's Mens letter. Each letter has been "chuck full" of news and I have enjoyed them immensely. You are really doing a swell job & I know it keeps you plenty busy along with your other work. I have been in Dover about two weeks, having transferred up here from Blackstone, Va. I am flying the P-47 Thunderbolt and now have about 80 hours in it. Most of the training at this base is gunnery. We fire on both ground and aerial targets. The aerial targets are towed behind B-26's, A-29's or B-17's. We fire at all altitudes, from the ground on up to 25,000 feet.